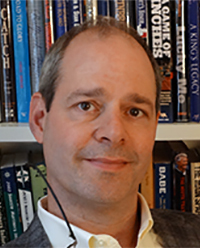 Dan Levitt (1962 - ) is the author or co-author of several baseball books, covering the Federal League, longtime Yankee general manager Ed Barrow, and the evolution of team building. The breadth of his research contributions includes biography, records (discovering the season record for lowest ERA), statistical analysis, labor relations (an extensive project with the Major League Baseball Players Association), economics (uncovering the truth behind Harry Frazee's finances), and more, studying more than a century of baseball history. He has received several awards for his research, and his extensive contributions to SABR earned him the Bob Davids Award in 2015.